I’ve always been a minimalist when it comes to self-care. I enjoy a nice touch of makeup, a good pedicure, moisturized skin, and brushed hair. But when it comes to lavish beauty products, I’ve never had the time or interest to explore the thousands of options on the market. Even before our lifestyle change, I never understood the concept of mouthwash, facial serums, or special eye creams. That is until I hit 30! With the turning of a new decade, I now understand the need for the thousands of beauty products marketed to us daily. Eye cream? Why yes, I believe my eyes could use some special treatment. Two kids + five years of iffy sleep (I love you, kids) = time for some serious eye cream intervention. Facial serum? Oh yes, let’s do it! And mouthwash? Well, that’s the subject of today’s post. Oh how I love to “eat” my words. Suddenly mouthwash doesn’t seem like such a frivolous product. Now, please don’t get the wrong idea about my oral health. It’s not like my breath smells of rotten onions. My breath is pleasant and my teeth are clean. (Is this post getting weird or is it just me? Let’s speed this up a bit). 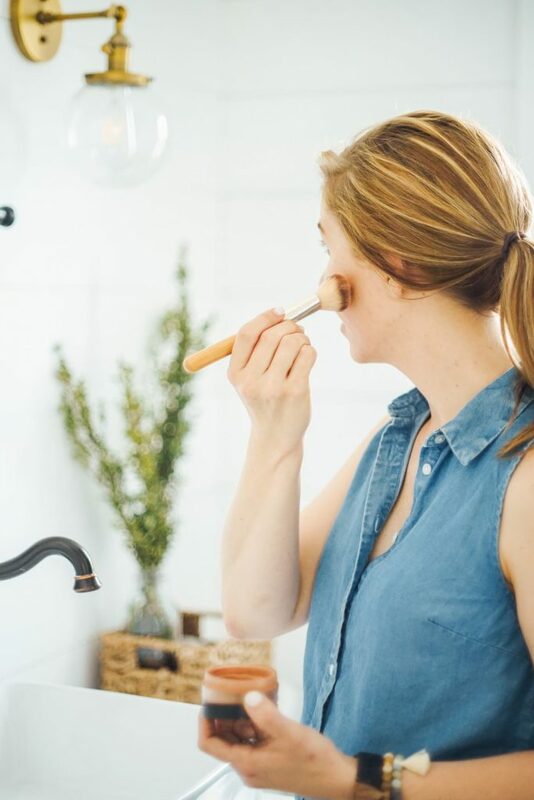 With age comes added responsibility, which means longer hours of having to look acceptable and smell fresh: traveling for work, meetings, an after school activity, or a special date night. In these times, I’ve come to understand the spectacular qualities of mouthwash. A good mouthwash not only freshens 4pm breath, but also adds a bit of pep to my step–there’s nothing like feeling like a garden of freshly picked peppermint leaves. 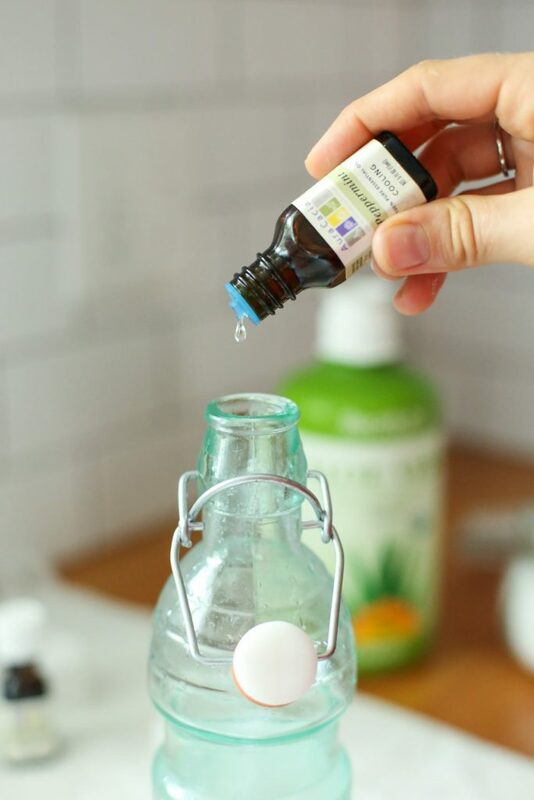 Making homemade mouthwash is super easy! As in five ingredient easy! Five ingredients that you can actually pronounce and probably already own. Let’s take a look at each ingredient. Baking Soda: Yep, the stuff you use to leaven quick breads, cookies, and muffins. When used in oral care, baking soda is believed to help neutralize acids, take care of odors (good-bye, bad breath! ), and fight germs. Some studies also show that baking soda may help fight stains on teeth. Essential Oils: Peppermint and Tea Tree are both used in this recipe. 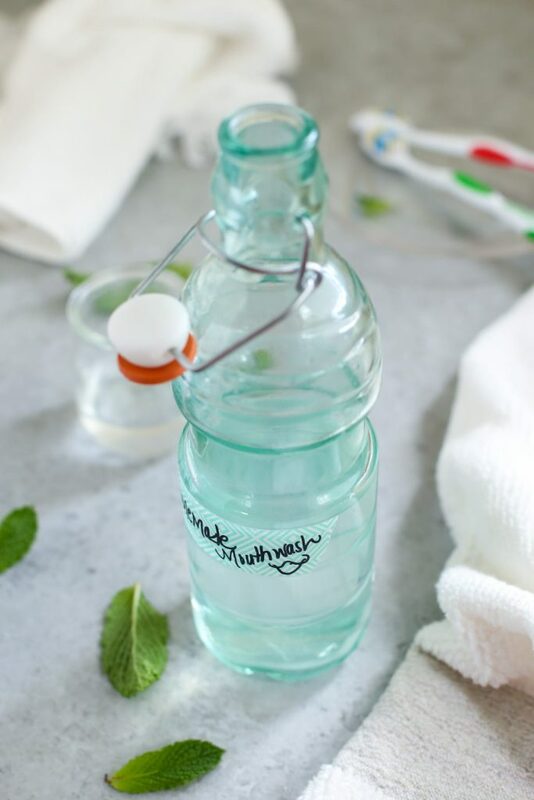 Peppermint provides a cooling, minty flavor to the mouthwash. Tea tree provides beneficial cleaning properties. Both oils are commonly used in household cleaning and homemade beauty products, so they aren’t limited to just dental care. The power of fresh breath awaits, my friend! 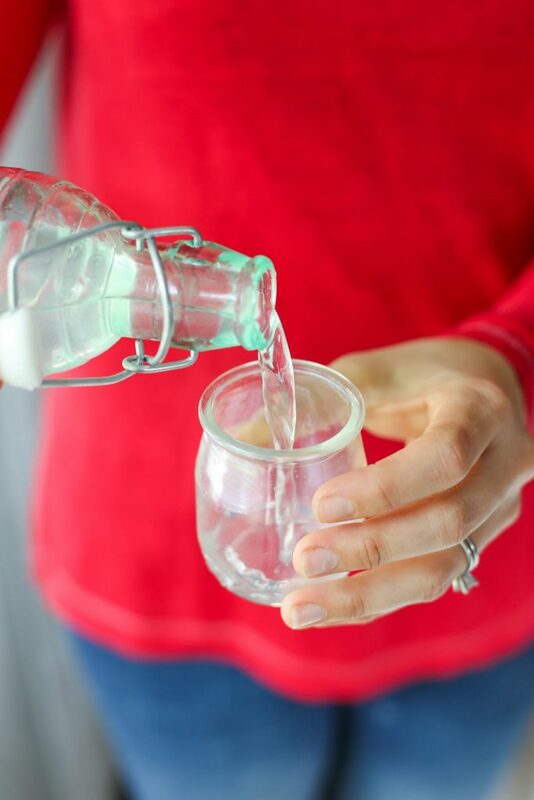 Making homemade mouthwash is super easy! As in five ingredient easy! Five ingredients that you can actually pronounce and probably already own. In a bottle (I purchase my bottles from HomeGoods or Target--check the kitchen gadget aisle), add all the ingredients. Seal the bottle and shake to combine the ingredients. The baking soda should dissolve after just a few shakes. I recommend storing this mouthwash in the fridge for long-term use due to the aloe juice which needs to be refrigerated. I keep my large bottle in the fridge. 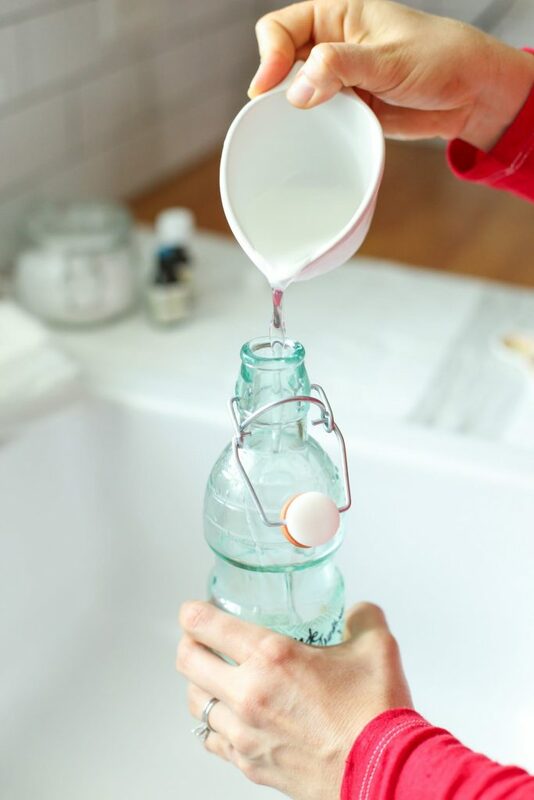 To Use: Gently shake the bottle and pour a small amount of mouthwash into a cup. Swish the mouthwash in your mouth for several seconds, then spit...I know, this post is getting very personal ;). As with any mouthwash, don't swallow. I don't recommend ingesting essential oils, no matter which brand you choose to use. Thanks for sharing this. I have been trying to make as much homemade things as possible, and this would be good to try. Awesome, Kaolee! This homemade recipe is a great one to make. Enjoy!! Thank you, Kristin, for this recipe. I will definitely put it to good use in my on-going journey to amore healthy lifestyle. I was a little taken back however, when I saw that you were using Aura Cacia oil in this recipe. I realize that you are not swallowing the mouth wash, but liquids that we put in our mouths absorb very quickly into our blood stream. I have no personal knowledge of Aura Cacia oil and how pure it is, but if you think this might be an issue for you there are therapeutic-grade oils out there. I use them for my tooth powder recipe. Thanks again. I’m happy that I stumbled upon your blog. I think it will be a huge help in my journey! Hey Stephanie, Enjoy the mouthwash! I’m so glad you found Live Simply! Regarding essential oils, Aura Cacia is a fantastic brand of oils. They are well-sourced and I have the utmost respect for the company. They are a sister company of Simply Organic and Frontier Co-op (I work with them outside the blog doing photography projects on occasion, so I’ve been able to get to know the companies under Frontier from the inside) and can vouch for their quality :). Here’s an article that may prove helpful regarding essential oils, quality, etc: https://livesimply.me/2015/03/07/essential-oils-101-22-important-questions-answers/. I personally wouldn’t recommend ingesting (swallowing oils in food or water) any oil brands, including Young Living or DoTerra, unless someone is seeing a practitioner. 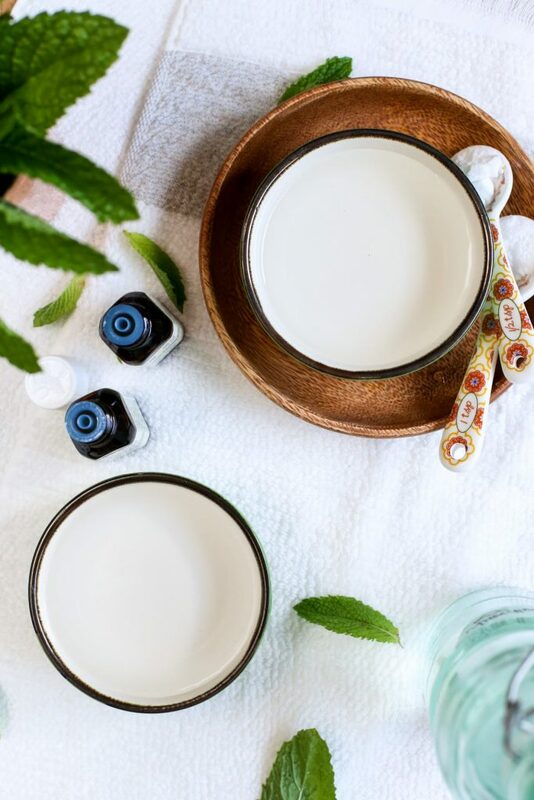 While the skin does absorb substances, purposely swallowing oils can prove very dangerous with repeated uses and when not overseen by a qualified practitioner for a specific reason. Is it okay to leave out the tea tree oil? Also, would it be okay to switch clove oil for the peppermint to have a little variety? Hey Toni, Yes, you can :). Clove oil is a “hot” oil, but good for dental health (from what I’ve read), so I would stick with just a drop. Hi Kristin, thanks for the recipe. I have aloe vera plants and am wondering what you think about using the gel directly from the plant instead of the juice? Hey Cheryl, You’re welcome :). I think fresh aloe gel would be awesome! The only concern would be the texture. Just thinking out loud, if the texture is funky (chunky) I would try mixing the the mouthwash with an immersion blender or mixer. The mouthwash might not last as long at room temperature, so storing the final product in the fridge will be essential. What would the shelf life be? Hey Adrienne, I’ve kept my mouthwash out at room temperature for 7 days without any issue. Any longer, I store the remaining mouthwash in the fridge. The mouthwash will last for several months in the fridge. I completely agree! I’ve been using mouthwash lately as one of those in-between things that helps out in the afternoon. I’ve been brushing twice a day but towards the end of the work day I find my mouth needs a bit of maintenance. I’m curious to hear about how you found these different ingredients. I’ve heard of baking soda, aloe vera and essential oils all being useful for oral health, but what led you to this specific recipe? 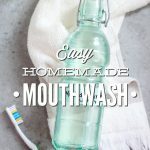 Hey Oradyne, I’ve stumbled across the research and suggestions as well that baking soda and aloe vera are great for dental health, so I used this research to create a mouthwash for myself. When I make a DIY, I also take a look at what’s on the market in health food stores. Many times the ingredients listed on these natural products are incredibly easy to reproduce at home with a bit of tweaking. Hey Kristin! I just came across your blog through Pinterest. I just have to say that I love your story! Eating processed foods has never really concerned me until recently. I thought, “I grew up on processed food and I’m just fine!” But I’m starting to realize that my adult body isn’t really loving the processed food anymore. I’m not quite ready to switch to a super strict diet, and may never do that. But I am trying to use fresh and healthy ingredients in my home cooking. I am excited to explore your blog some more! I just have a quick question on the mouthwash. Does it leave a bad aftertaste? That’s the main reason I haven’t used store bought mouthwash, I can’t stand the aftertaste. It leaves a terrible taste in my mouth for hours. And it burns. I’m looking for something that will be good for my mouth and teeth, but not leave that horrible taste. Also, what else do you use Aloe Vera juice for?? I have never even heard of it until now. Thank you! – Oh, and I think your blog is beautiful. I totally understand about the processed food. 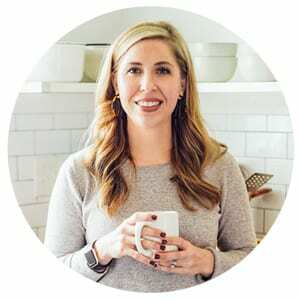 I felt the same way, and then once I began reading and learning about the food we were consuming, I was quite shocked to realize most of it wasn’t even food: lacking naturally-occurring vitamins, minerals, and nutrients. I’m excited for you! I love the idea of “real food” (presented originally by Michael Pollan) because it’s a lifestyle of just eating the way great-grandma did, and as you mention “fresh and healthy ingredients in… and home cooking.” I love the fact that it’s not a restricting diet, but rather a delicious lifestyle! You’re doing an awesome job at adopting this lifestyle already!! For the mouthwash, I haven’t found that it leaves an aftertaste. It’s pretty neutral, other than the essential oil which can be added for “flavor,” but even that taste doesn’t linger. I really prefer using aloe vera gel in my DIYs, it’s super soothing for the skin, but it’s thick, so I use aloe juice in this recipe. Aloe vera juice is sold as a “dietary supplement” so you can actually drink it in small amounts. From what I’ve read, it’s great for the digestive system and immune system. You could definitely try gel, which is more versatile for DIYs, but it will create a thicker product. Hey Amy, Hmmm, I’m not sure if there’s a substitute. 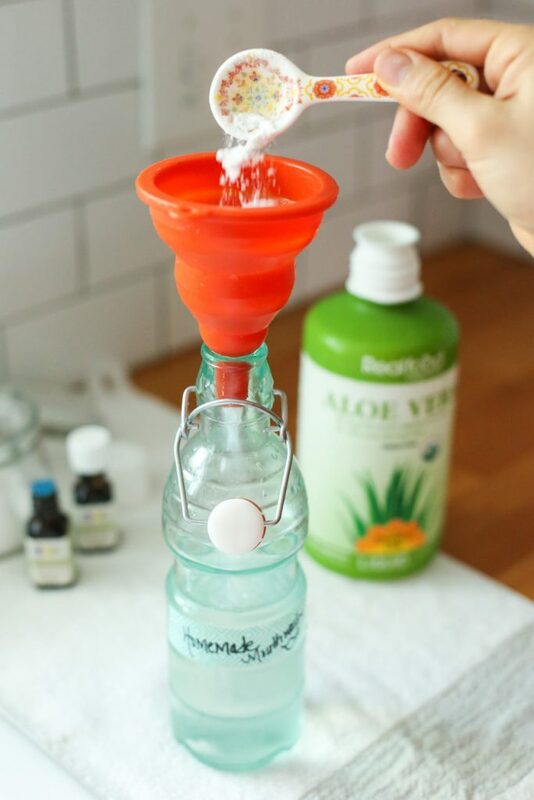 You could try fresh aloe in small batches, or just leave it out and let the baking soda and water do the “magic.” You could also try an herbal mouthwash, like this: http://mountainroseblog.com/herbal-mouthwash-recipe/. This recipe sounds amazing! I can’t wait to try it! Got the Aloe Vera juice in the cart right now. 😉 But I have a question: What do you think of the idea of putting coconut oil or peroxide in the mouthwash? Hey Bree, I think either one would be a great addition. If you go with coconut oil, I would use fractionated coconut oil, since it’s in liquid form. Could you use a hydrosol instead of the distilled water? Hey Phil, I believe so. When I clicked on your aloe Vera juice where to buy I was sent to Amazon and purchased it. When I got it I saw it was aloe vera plus with a lot of extra ingredients. I don’t want to drink it. I just want to make your mouthwash. Can I still use it or should I return it? Not sure if any of those ingredients would be absorbed by swishing it in my mouth. 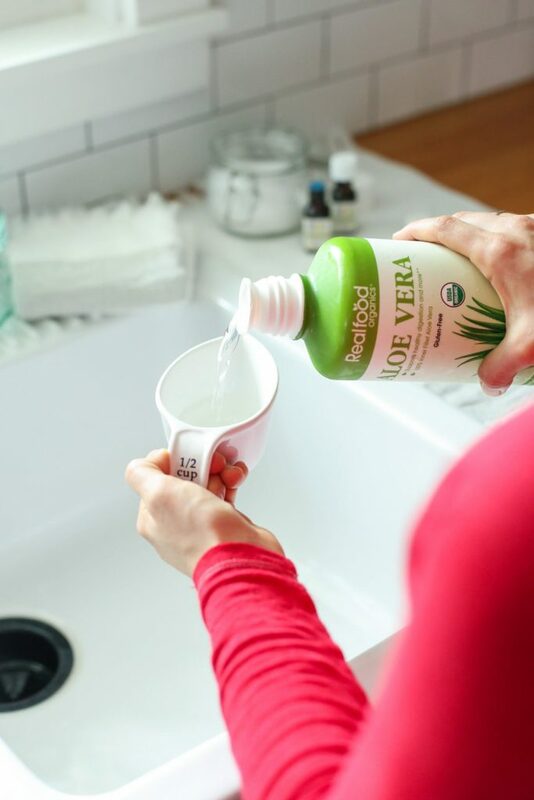 Hey Laura, I haven’t been able to find an aloe vera juice that doesn’t have additional ingredients, just because aloe goes bad quickly–even the regular one has additional ingredients. I’m not about the additional ingredients in the Plus, but my guess is that they are safe for the mouthwash. And thank you for brining the Plus to my attention–Amazon must have switched out the regular with the plus. I’ll update that link. Hey Laura, I would use the aloe juice with the additional herbs. Which ingredient is the emulsifier in this receipt? Thanks. Hey Marina, An emulsifier isn’t needed in this recipe since oil and water aren’t mixed together to create the final product. I found your recipe in the newest “Willow and Sage” magazine. I started reading about the popular storebought mouthwash we were buying and it scared me to see what we used thinking we are staying healthy! The same day I made a shopping list and we went to the local health store. The first use was strange – it was so much different that painfully minty store brand, but the next day I enjoyed taste of essential oils and the fact that my mouth did not burn after using it. Thank you for sharing the recipe! Hey Weronika, Thank you for popping over to Live Simply to share your experience with the mouthwash! I’m so glad you’re enjoying this! I was wondering…Can I use virgin olive oil instead of essential oil? Hey Vangelicest, Essential oils are very unique and not like traditional oils (sunflower, olive, etc. ), so unfortunately olive oil won’t work. Can I leave out the baking soda and add som xylitol. I think my family likes a sweet mouthwash. Hey April, I would try reducing the baking soda and adding a bit of xylitol. I wouldn’t take it out completely. Hi Ktistin. Is this mouthwash ok for kids to use as well? Yes, I believe so. As long as they don’t swallow. I’m not sure if that’s just cautionary since they list their intended use as aromatherapy, but it seems they may not be the best for putting in your mouth. Hey yesenia, Essential oils, no matter what the brand may be, are not intended to be consumed unless you’re under a doctor’s specific counsel. Essential oils are incredibly potent, which is why they are always diluted and should not be consumed as a food or drink–any company that labels or advertises their oils otherwise is putting consumers in danger (in my opinion). A mouthwash shouldn’t be consumed as a drink (taken internally), as with any store-bought mouthwash with the same “do not ingest” labeling. 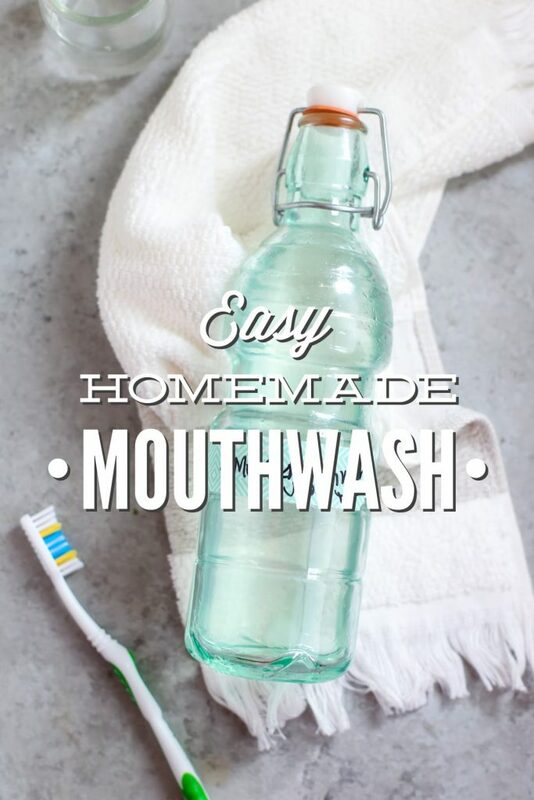 Thanks for the recipe for a natural mouthwash seems very easy. Hi Kristin! Would this still be effective if I left out the essential oil or is that necessary for cleaning the teeth? Sounds like a great recipe I can’t wait to try it out.my new years resolution is actually to try more homemade hygiene products. I love making them and always feel better for using them.